In the recent times, we have successfully highlighted all the major updates and innovations related to different Google products including Gmail, Google Babble and Blogger. I hope you have been following us on BloggingeHow. Today I will talk about a rather simplistic approach towards hosting a website using another of Google's product - Google Drive. Hosting a website does not sound very convenient if you do not have an approach to a web server. But today you will be surprised to know how Google Drive easily provides an alternative to this issue. Now the big question. How to do it? As mentioned earlier, you will be surprised to know how convenient and easy it is host a website on Google Drive, with just a couple of easy steps. 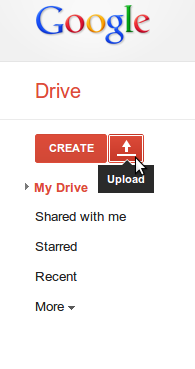 First and foremost you need to upload all the website related files inside a single folder in Google Drive. Make sure this folder has the sharing settings set to public'. You also need to have the URL of your website. For this, you should open the index.htm file in one of the website files you uploaded to Google Drive. Open this through the Google Doc Viewer and click on the 'Preview' button to get the URL of your website. Note: I suppose you already know this, but it is important to have the index.htm file as it will be served when a third party user tries to access your website's homepage. Make sure you didn't miss out the file while uploading. You can also the Google Drive website under your own custom domain. This is very simple to achieve. All you need to do is to put the Google Drive website URL, that you obtained earlier, inside an IFRAME tag. You can see this below. In order to see the website results in full screen window, don't forget to change the height and width attribute of the IFRAME tag to 100%. Also keep in mind that the URL will not change even you choose to open a different web page from the same website. This is because you are browsing inside an embedded page. Google Introduces New Gmail Tabs: How To Use Them? BloggingeHow | Making Blogging Simpler: How To Host Your Website On Google Drive?